Film studios aren’t very good at keeping a lid on things, are they. They seem to spring more leaks than a colander, especially when it comes to Marvel. As most people are keeping their ear to the ground for news about Avengers 4, the new Spidey film – called Spider-Man: Far From Home – has slipped out a few set photos of its own. 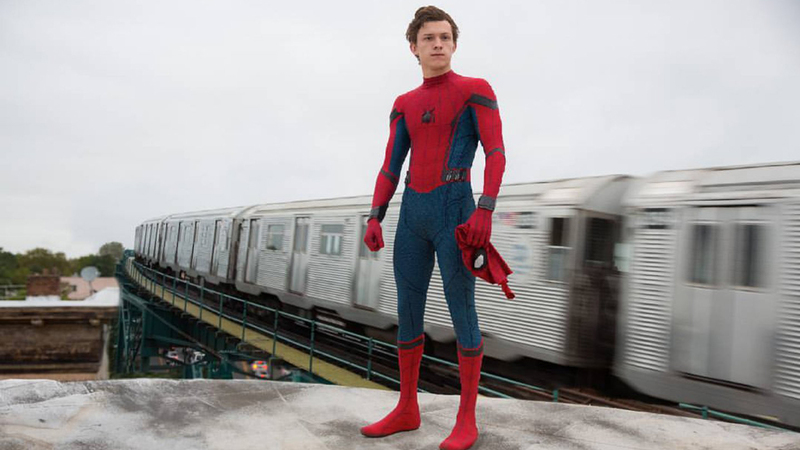 New shots show Peter Parker/Spider-Man/Tom Holland/Tom Holland’s stunt double swinging about and apparently rescuing MJ, played by Zendaya, outside Penn Station in New York. All well and good, and pretty much exactly what you’d expect from your friendly neighbourhood victim of a radioactive spider bite. But look closer – what’s that costume our superhero is wearing? Is it black and red with a white logo, rather than the blue and red we’re used to? Yes. Yes it is. Other photos leaked from the same film appear to show Peter Parker experimenting with his look. He is young, after all, it’s something we all did. Like a number of teens his age, he’s also swapped his usual outfit for something a bit more ‘gothic’, a sleek black suit – although thankfully he’s forgone the black leather trench coat. The pictures, which were taken on location in Prague, Czech Republic, show the wall-crawler perched on the side of a Ferris wheel in his black threads, blending perfectly into the night’s sky. Fans are speculating what the Web Head’s new suit could mean for the movie with some even suggesting that the suit may be the infamous symbiote suit first introduced in Secret War. Unfortunately for people keen to see Spidey and the black suit together in symbiotic harmony (we’re ignoring Spider-Man 3) it’s unlikely to be a ‘symbiote’. Without getting too much into the dull internal workings of licensing agreements and movie studio blood pacts, while Disney is currently allowed to use Spidey in their films they can’t use Venom or the symbiote. Meanwhile, the rights to Venom belong with Sony whose studio is pushing forward with their own Spidey-less cinematic universe built around the Spider-Man’s rogues’ gallery and supporting characters. This means it’s far more likely to be something like the ‘Stealth Suit’, first introduced in the Big Time storyline, a black and green suit which can render Spider-Man invisible to his enemies’ eyes and ears. Currently, we’ve no clue what Far From Home’s about other than it will see Peter Parker ‘far from home’ as he travels across Europe. Elsewhere, even more leaked photos seem to suggest Jake Gyllenhaal joining Tom Holland and Zendaya in the cast of Far From Home. Photos, again from Czech Republic, appear to show Gyllenhaal as Mysterio, aka Quentin Beck, the deceptively cunning super villain comic books fans love to hate. If true, this will be Mysterio’s cinematic debut, meaning the pressure will be well and truly on for Gyllenhaal to bring the iconic comic book character to life.